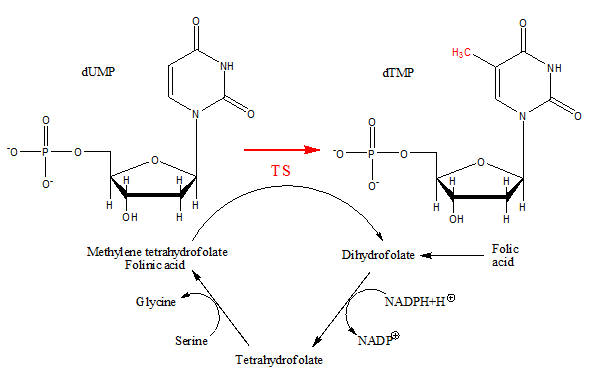 Thymidylate synthase is the enzyme responsible for the conversion by methylation of deoxyuridine monophosphate, dUMP, to thymidine monophosphate which is a deoxyribose called either TMP or dTMP which after conversion into thymidine triphosphate, TTP, is incorporated in DNA. It is an enzyme with two substrates which forms with dUMP and methylene tetrahydrofolate a ternary complex where methylene tetrahydrofolate yields a methyl group to dUMP. 5-fluoro-uracil, after its conversion into 5-fluorodeoxyuridine 5 ' - monophosphate, 5-FdUMP, an analog of dUMP, inhibits thymidylate synthase. It has other mechanisms of action studied further in this chapter. Raltitrexed (Tomudex*) is a thymidylate synthase inhibitor. It is a structural analog of methylene tetrahydrofolate with which it enters in competition at the level of thymidylate synthase and inhibits it. Raltitrexed penetrates into cells via the physiological carrier of reduced folates. In the cell, it binds, under the influence of folyl-polyglutamate synthetase, one or more molecules of glutamic acid. Thus conjugated with glutamic acid, it persists a long time in the cell, which explains the possibility of its discontinuous administration. It is used for the treatment of the metastatic colorectal cancer by intravenous infusion, once every three weeks. Its dosage should be reduced in patients with renal impairment. Pregnancy should be avoided if one of the partners is taking or has been taking raltitrexed in the past 6 months. It gives gastrointestinal and blood adverse effects. Pemetrexed is an anti-folic acid which inhibits thymidylate synthase but also dihydrofolate reductase and glycinamide ribonucleotide formyltransferase. It is indicated for the treatment of malignant pleural mesothelioma and non-small cells lung cancer, which have already been treated by chemotherapy.